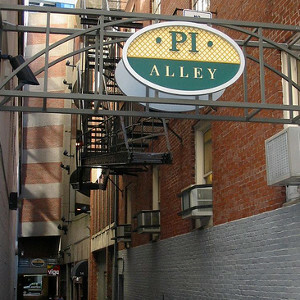 The Alley is a bar down Pi Alley near State and Downtown Crossing. Recently renovated, this bar has 2 floors and regularly screens sporting events (including RuPaul's Drag Race) on their TVs and projectors. Most events (such as Underbear, Fuzz, and Sleaze) on the upper level feature a DJ. This bar tends to cater more toward the bear/cub/otter/daddy crowd. It is not to be confused with The Alley Bar at Rowe's Wharf. Two floors and plenty of TVs. All bars are open. Dave Sawyer hosts Trivia at The Alley every Thursday Night. Cash prizes.